From North or South of Charlottesville take Route 29 to the Route 250 East Bypass (to Richmond). Follow Rt. 250 East to Interstate 64 East and turn left onto Interstate 64. 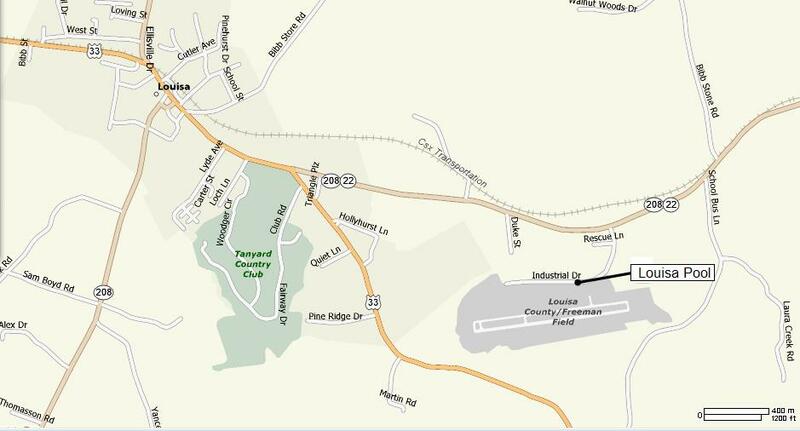 Take exit 143 for VA-208 toward Ferncliff/Louisa and turn left onto VA-208. Continue 8.9 miles and turn right at US-33/VA-208/VA-22. Stay straight on this road for 2 miles, following the signs towards the airport, and turn right at Industrial Drive (there is a large Airport Industrial sign). Go 0.5 miles and turn right into the entrance for the Betty Queen Intergenerational Center (marked with a tan and stone sign). Drive around to the back of the Main building by turning left. The pool and parking are located at the next building on your right, behind the Main Center. The pool is an outdoor pool and the building is a locker room entrance. From east of Charlottesville take Route 15 North or South to Interstate 64 east. Take exit 143 for VA-208 toward Ferncliff/Louisa and turn left onto VA-208. Continue 8.9 miles and turn right at US-33/VA-208/VA-22. Stay straight on this road for 2 miles, following the signs towards the airport, and turn right at Industrial Drive (there is a large Airport Industrial sign). Go 0.5 miles and turn right into the entrance for the Betty Queen Intergenerational Center (marked with a tan and stone sign). Drive around to the back of the Main building by turning left. The pool and parking are located at the next building on your right, behind the Main Center. The pool is an outdoor pool and the building is a locker room entrance. From Charlottesville or West of Charlottesville follow Rt. 250 East thru Charlottesville to Interstate 64 East and turn left. Take exit 143 for VA-208 toward Ferncliff/Louisa and turn left onto VA-208. Continue 8.9 miles and turn right at US-33/VA-208/VA-22. Stay straight on this road for 2 miles, following the signs towards the airport, and turn right at Industrial Drive (there is a large Airport Industrial sign). Go 0.5 miles and turn right into the entrance for the Betty Queen Intergenerational Center (marked with a tan and stone sign). Drive around to the back of the Main building by turning left. The pool and parking are located at the next building on your right, behind the Main Center. The pool is an outdoor pool and the building is a locker room entrance.